In what is likely the most interesting immigration-related news tidbit in the pop culture sphere, ABC News reports that a New York-based human rights group called Breakthrough has designed a video game called "ICED! ", or "I Can Escape Deportation!". The game, free to download here starting this September, allows players to step into the role of an undocumented immigrant in the United States, with the ultimate goal of avoiding deportation by the immigration authorities. ICED! players are required to make "moral choices." Jumping turnstiles in the subway or robbing stores causes players to lose points and puts them in danger of getting caught by an immigration official and detained or deported. Conversely, players can gain points and avoid detention by planting trees, helping the elderly or volunteering around their community. According to Breakthrough's Web site, the game simply and directly "teaches players about the unjust nature of U.S. immigration policy." 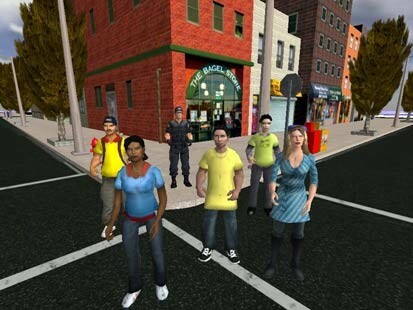 Random deportation trials, long lines to use the phone and sexual harrassment in detention centers are among the situations depicted in the game. Anything to pump up the open borders propaganda, eh Frank? Propaganda my foot. Everything in the game is based on real situations. who ever the idiot that invented this let me tell you yhis isn't funny. good day friends. I'm honestly into shoes and I had been looking as far as something that exact model. The prices due to the fact that the boots are approximately 320 pounds everwhere. But definitively I set this location selling them as a remedy for half price. I in reality want those [url=http://www.shoesempire.com]prada sneakers[/url]. I will probably order these. what can you tell me about these? good evening ppl. I'm actually into shoes and I had been digging for that meticulous make. The prices as regards the sneakers were all over 190 dollars on every site. But definitively I found this location selling them as a remedy for half price. I absolutely want these [url=http://www.shoesempire.com]prada sneakers[/url]. I will absolutely purchase them. what do you think? good evening people. I'm actually into shoes and I have been digging as far as something that singular brand. The prices as regards the shoes were around 180 dollars on every page. But completely I bring about this site selling them as a remedy for half price. I really want those [url=http://www.shoesempire.com]gucci sneakers[/url]. I will absolutely order these. what do you think?